(Bloomberg) -- Commercial mortgage-backed securities could see big losses if troubled mall loans aren’t refinanced before they mature in 2020, according to Fitch Ratings Inc. The biggest risk is if the borrowers decide to walk away from the property in order to avoid foreclosure, Fitch analyst Huxley Somerville wrote in a research note Friday. Loans in commercial mortgage-backed securities are typically for a period of 10 years and those first issued after the financial crisis will start to mature next year. That means 2019 should provide a preview of what to expect in 2020, Fitch said. Fitch is concerned about 10 of 15 mall loans in CMBS deals that they cover and that are set to mature next year. “It’s very difficult to predict" how three of those loans will fare when they mature, Somerville said. Only two look solid. Mall operators, eyeing defaults caused or made more likely by shuttered anchor stores and unwilling to throw money at the cost of refinancing, have been handing over their keys to lenders even before leases end. That’s been forcing loan-servicing companies to either take a shot at running the properties or sell them cheap. And if they’re unable to salvage the debt payments, investors in CMBS will take a hit. 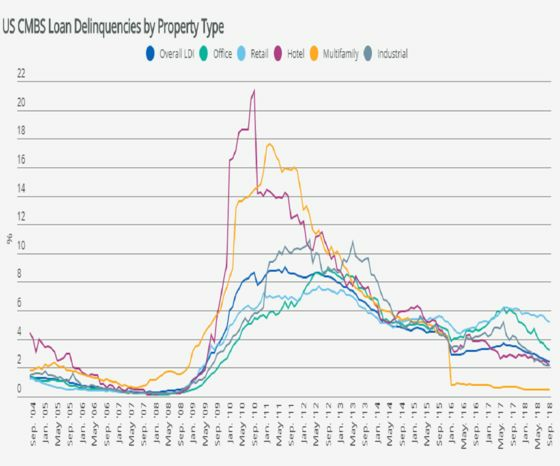 “While some malls can be repurposed or repositioned, when the borrower decides to ‘walk away’ the loss severities have been among the largest in CMBS,” Edward Shugrue, a CMBS portfolio manager at RiverPark Funds, said.